Indie rock has a new upcoming star in Go West Young Man. Released last October 2012, AGES is the band’s latest musical project that’s mastered to radio-polished perfection. Hailing from Los Angeles, Go West Young Man started as a musical project of Damin Suarez and Matt Nakamura in 2005. It later evolved into a full-pledged band with the addition of David Mayer, Sarah Wood, and Dayna Richards. En Route welcomes our ears with catchy piano melodies and steady hooks. This track perfectly opens the collection as it evokes an indie vibe that’s both unique yet accessible. In Highschool, the band showcases some heavy riffs and rock sensibilities. I love how the song is edgy and thick but still kicks with a groovy feeling. On the other hand, American Gold is a soothing piece that boasts a variety of instruments that are well-arranged into sonic perfection. A standout track, Consumption Junction tickles your senses in all the right spots. Open a bottle of wine, remove those tiring heels, and just dance with this song. Venturing into a stripped down, acoustic approach, Sailboat is a pleasant breather from the all the energy on the previous tracks. Dark and sensual, We Still Work Here closes the collection in the right, soothing mood. 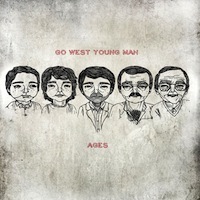 Go West Young Man is a band to watch out for. In AGES, the band has produced a collection that can be at par with mainstream rock pop tunes. With their passion, taste, and undeniable talent, it will just be a short time until this band shines.